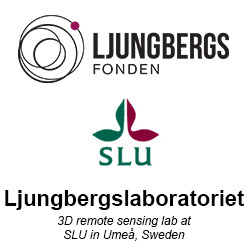 On Wednesdays between 13:00 and 15:00 there are workshops in the lab in Umeå, Sweden. Previously we called this open-lab, but now we prefer to call it workshops. The idea with the workshops is start at 13:00 with a short introductory presentation of a remote sensing topic, for example use of drones in forestry. The presentation is 20-30 minutes long and after this the lab is open for you to hands on experiment and work with remote sensing data. We will always supply data for you to experiment with, but you can of course bring your own. Or use the labs equipment to collect new data. The lab closes at 15:00. We give you a high tech lab with the latest technology and a researcher in the field to who you can ask questions and discuss. On these pages you can read about the available equipment and softwares in the lab.